Help : The Import Loader Format Window is used for defining the file layout for product information which will be imported. Help : Define the individual field based on the table definition. Please note that you have to make sure that a Constant has the correct SQL data type (i.e. if it is a 'string', you need to enclose it like 'this'). Start No Starting number/position The Start Number is used to assign data fields in the source data file to the import data record. The Start Number indicates the starting position or column number of the field in the source data. The first column/position in each line of the source data file has Starting Number = 1. The Starting Number does not have to be in order or contiguous and the data file can have many more data columns than the ones imported. If you setup your format field records in the same order as your source text file, you can use the sequence number divided by ten to specify your start number, and not loose track of which column you're up to. After defining the import format and its fields, the next step is to import calling the Import File Loader. Format Field tag: The column contents depend on the table selected in the Import Format tag. Format Field tag: The date format must have the months in capital letters (MM). Otherwise, the data will not be recognized as of the Date format. Format Field tag: You can define some fields as "constants". The columns of the fields defined as constants do not need to be imported, but are fed with the same value for all imported lines. Format Field tag: Start No determines the field of the import file which is to be processed. Format Field tag: It is possible that a column retrieves information out of several fields of the import file. End No determines the last field of the import file which is to be processed. End No appears only for fixed position import files. 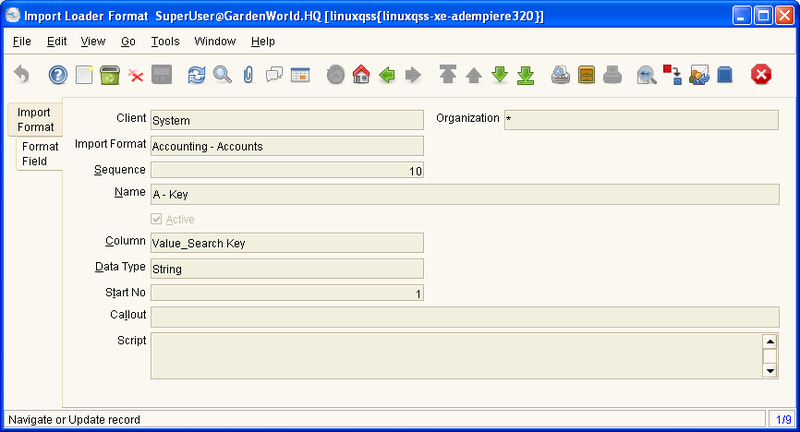 The Start Number is used to assign data fields in the source data file to the import data record. The Start Number indicates the starting position or column number of the field in the source data. The first column/position in each line of the source data file has Starting Number = 1. This page was last modified on 29 September 2009, at 17:55.